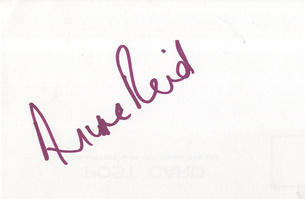 This is an In Person signed white card 5.5" x 3.5" by the English actress. Anne Reid, MBE (born 28 May 1935) is a BAFTA Award-nominated English film and television actress from Newcastle upon Tyne, best known for her roles as Valerie Tatlock in Coronation Street and Jean in dinnerladies. Reid was appointed Member of the Order of the British Empire (MBE) in the 2010 Birthday Honours.